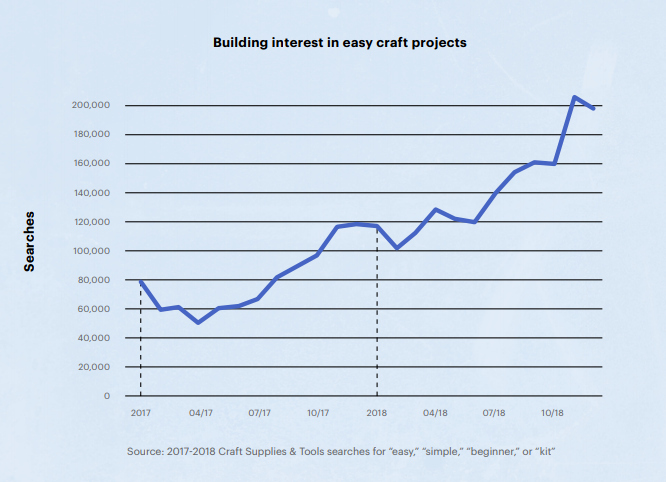 Etsy releases periodic seasonal trends reports these days, and recently came out with spring & summer trends for 2019. If your shop relies a lot on hitting trends, or if you want more ideas for featuring the items you already have in stock, you will want to read the whole thing yourself. If those aren’t your main focuses, read this post! My coverage mostly centres on the search term and keyword highlights (with just a few exceptions). These are terms you should use on your listings when they apply, and if you have any items or ideas that aren’t currently listed but fit here, then let me be the first to tell you to get those listings up as soon as possible! Some of the trends mentioned are still on the rise, so if you have stock, or even just an interest, consider putting a few new products in your shop (or on your website - many of these trends are not exclusive to Etsy). Note that most of the stats about increases in search traffic compare 2017 to 2018, so there is no guarantee that they will continue to rise in 2019. However, I expect Etsy would want to focus on trends that aren’t yet post-peak, as it wouldn’t make sense to tell sellers to hop on a bandwagon that has already passed. Etsy wants sales, after all. Some keyword lists cover the spring and summer seasons of 2018; use those as a reference only, and check whether broader interest is still high by entering individual terms on Google Trends. All quotes and graphics are from the linked pdf file; copyright belongs to Etsy. My editorial comments are in square brackets, including some Google Trends data I added for perspective. 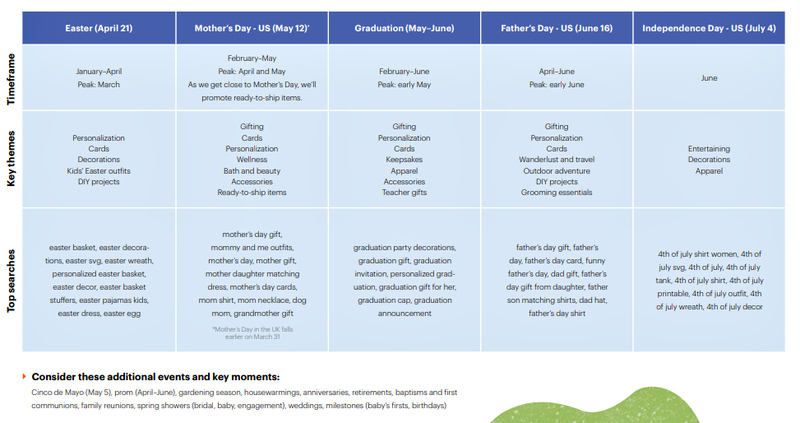 Page 5 did a chart with the top keywords and themes for the 5 spring & summer holiday and event occasions: Easter, Mother’s Day, Graduations, Fathers’ Day, & US Independence Day, shown below. Want all the latest Etsy search tips? Sign up with your email address to receive important Etsy news and updates! I respect your privacy. Your information will only be used to send emails with my new blog posts. Page 43 offers some tips on how to make use of this data. Note they suggest putting crucial keywords in both titles and tags; these are very competitive searches and require that repetition for optimization. Remember, though, even if you cannot rank for the most competitive searches, you can still show up well in “long-tail” (very specific) searches by using these terms with niche words, because long tail searches often have the most popular terms as part of a longer phrase. I am still working on finding new places to host my business/SEO forum. My shorter news posts are now on Tumblr, and I hope to move my forum off-Etsy soon, and open it to new members at that time. If you have ideas on where I can start a new forum, please let me know in the comments, or email me. Sign up for my blog emails, or follow me on Twitter, to keep up to date on Etsy news and where I am reporting it. A screenshot of the new Etsy forum, as shown in an Etsy blog post. In case you missed it, Etsy is suspending the forum and teams from January 10th to 22nd; you will be able to read the current forum as well as public teams and teams you belong to, but will not be able to post during that time. As of January 22nd, the new forum will be open and available for all members to post in, as will all teams that have had posts since November 2016; older teams will not be moved to the new format. So if you have an inactive team you want to save in the new format, make sure you post a thread on the team by the end of January 9th. Etsy provided a short blog post with more details including a few screenshots, and has also written a help file for team captains and leaders, providing more information about this transition. (Please read that if you are a captain or leader; I don’t summarize every detail below.) But some of this is written in Etsy-speak, and as usual, staff have clarified some points elsewhere, so I’ve compiled the most relevant details below to keep you informed. If I have missed anything, or have made any errors, please post a comment to let me know, or send me an email or convo with the new content. They really did mean it will take 2 weeks. I have seen some debate about how long the closure will be, but Etsy has confirmed that they meant the whole time period. Of course, they may finish earlier, or it may take even longer. The Bugs forum will remain open for new threads and posts. No explanation was provided as to why this one section can stay open while the other ones will be frozen. Etsy is transferring forum threads with posts in the last 3 years, but note that they closed all threads older than 2017 many months ago, so none of those threads will show up in the new space, according to staff. That means over a decade of community history will vanish. Make sure you copy or screenshot anything you want to save for posterity! All existing team threads will move to the new space. We were told last September that only the last 2 years of posts would be be part of the new Team space, but after many of us protested last fall, they delayed the migration and decided to move everything. Please note that does not include threads captains have deleted, which captains can currently see, and even restore, in the existing format. The new format will include new tools, including the ability to like posts, to indicate that your question has been answered (which should cut down on those 7 page threads where everyone says the same thing because they didn’t read the other posts), and basic formatting. No more closed teams that do not accept new applications, and no questions for team applicants to answer. We will still have the ability to reject new applicants if we chose, but we won’t be able to close applications entirely as we can now. Please note that I will simply be ignoring all new applications to my SEO team, as it will remain closed for the time being. Teams will automatically see a banner with “important” Etsy news when it occurs. I expect that will mostly include new tools they want us to pay for, and will not necessarily include everything we need to know. Think of all of the notifications on your shop dashboard that people complain about! (e.g., the holiday banner) I am quite disturbed by this, & am now more actively looking for off-Etsy alternatives for my SEO team. The new forum and team spaces use the same software that eBay and PayPal use for their forum spaces. This software can be substantially modified for each site, however, so Etsy won’t necessarily work exactly as those sites do. There was a beta testing group, but they are not allowed to talk about what they saw during the test. Of course, some people have posted what they saw anyway. Apparently, there are going to be many new forum sections, and some of the existing ones, including Promos and Chit Chat, did not appear in the beta test. That does not mean that Etsy will not keep them in the new format, since the beta test was supposed to be a way to get user feedback on what needed to be changed. Also, team posts are apparently private only, meaning certain promotional threads, or posts like my recent ecommerce and SEO news thread, will no longer be available to non-members. I am actively searching for an alternative in case this happens; please let me know if you have any ideas. We will have to wait and see if all of this is true. The reaction of a few forum regulars when they found out their fix will be closed for almost 2 weeks. Why Is This Going To Take So Long? We don’t know. They said it is because there are so many posts and teams to transfer, and also that they need to put finishing touches on the new spaces. However, many of us have participated in larger system transfers that have been completed in far less time, and Etsy originally meant to do this in the fall, so they have had plenty of time for testing to see if everything works. I would not be surprised if they drop something new while the forum is closed, but please note I do not have any inside information that leads me to believe that. It just feels like something bigger is going on. Want to keep up with all of the big Etsy news? Sign up here with your email address to receive all of my new blog posts when they are released. I follow all privacy laws; I will only use your email address to send you my new blog posts. In the interim, I have opened a Google+ collection that will provide the usual Etsy, SEO and ecommerce news I post on my team. Please post there or in the comments here, or email or convo me, if you have any news you want to share. Many teams and forum regulars are migrating to Slack, Reddit, Facebook and other forum/chatroom options while the Etsy community is read-only. Check your team forum now to see if anything has been set up. There are no search results for “dinosaur pendant unisex” for my location, even though I have used the Recipient attribute “unisex adult” on several of my fossil pendants. So why is Etsy telling sellers that attributes are searchable like tags? Last Wednesday, Etsy released a new and supposedly comprehensive guide to its search algorithm, and as is often the case, it created more confusion than clarity. With one bombshell surprise, a confirmation of many older factors, and some flat-out wrong statements, “The Ultimate Guide to Etsy Search” should be read very carefully, and its statements tested wherever possible. Of course, I know you don’t have time for that, so I’ve done it all for you! The following blog post covers what you need to know. While some sellers vehemently disagree with this assertion, Silverman’s statements are backed up by other research. Furthermore, with Etsy spending more on advertising and bringing in new buyers faster than ever before, it’s likely more true now than when they did the research. Those outside shoppers finding an item through Google ads don’t necessarily know about the site’s history and ethos. To convince sellers to reduce their shipping fees, Etsy now tells us that “Etsy Search factors shipping price into search ranking. Lowering your shipping prices makes your items more likely to rank higher in search.” Read that again, carefully. They didn’t say you had to offer free shipping (although they mentioned elsewhere that “[o]ffering free shipping could improve your search ranking even more”), or even super-cheap shipping. They said that items with lower shipping prices are “more likely” to rank well, not that they are guaranteed to do so. With Etsy continuing to highlight free shipping listings as in the search test above, we know this push is not going to go away. Through testing, I did not find even a small effect from reducing shipping charges or offering free shipping on listings, at least in the short term. Since last fall, I have been tracking the performance of a small number of listings in my jewellery shop that offered free shipping, and at best there was a tiny uptick in search views recently, but not across all of the listings. Last week, I changed numerous other items in several ways to test various possible scenarios: raising shipping, doubling shipping, reducing shipping, and offering free shipping, both with and without raising the item price. The only tests that showed a close to consistent ranking change were the ones where I raised shipping a large amount, to more than double Etsy’s suggested average domestic rate, and even those results were not statistically significant, although almost all of the listings dropped in all of the test searches. A few of the items that I increased shipping on actually rose in some searches, so this factor does not appear to be large, if it currently exists at all. However, I do assume it will become a larger component of the algorithm in the future, because cheap shipping is the direction Etsy is heading in. Also, based on Etsy and other research, reducing shipping by adding it to the item price will likely increase sales for some types of sellers on some items, which will increase their search scores, meaning this has already become an indirect search factor. Most Canadian jewellery shops keep their items under 2 cm thick so they can ship for $1.80 CAD, but items just a hair thicker can cost over 10 times as much to mail. This message is laughable. Like most other search factors (and business tools in general), each shop owner will need to make decisions that suit their business plans, not Etsy’s. Most Etsy search bumps and penalties are pretty small, so you can afford to ignore a few that will not work for your items and brand, especially when your direct competitors are in the same situation. If everyone gets a penalty for high mailing costs, you all still end up equal. Be aware, though, that Etsy isn’t going to have a change of heart here; they are going to continue to push free shipping in particular, and not just through search. Could Etsy make this more palatable for sellers, and even more fair? 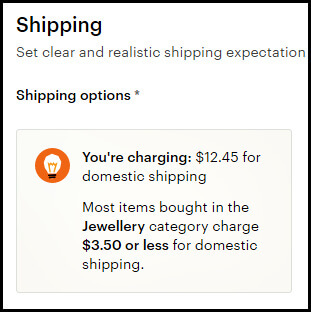 Yes, they could easily come up with a more realistic metric than the average shipping cost across the whole category (shown on the right). A full bookshelf costs a lot more to mail than a candle holder, but they can both be in the same top level category. Sending bookshelf sellers the message on the right just makes Etsy look clueless, and clueless isn’t going to help convince sellers to reduce their shipping prices. Summary: If shipping prices are already in the algorithm, the impact is very small, according to my testing. If your domestic competition ships for less, however, that could hurt you both in search and in general, because Etsy is going to keep promoting free shipping. I am glad to see they are getting rid of the forum penalty aspect, as a person who runs afoul of Etsy’s strict forum rules is not necessarily going to provide a bad customer experience. None of the rest is surprising, and since most large shops get poor reviews and cases opened occasionally, it isn’t unfair - we will all have to deal with it occasionally. I don’t see this score hurting you much unless you have many problems piling up, as evidenced by the large number of listings with review ratings under 5 stars that still rank well. Etsy put far more emphasis on keywords, photos, and buyer behaviour than on the customer service factors in its new Guide, so don’t get too hung up on this. LISTING QUALITY SCORE INCLUDES THE CART? : We’ve known for years that buyer behaviour such as clicking, favouriting or buying a listing contributes to search ranking. However, one of the new short videos released last week also refers to items being added to a cart. Check out the video on the left starting around 1:10 , where the staffer explains that how many people “add it to their cart or make a purchase” from search results is part of a listing’s quality score. Furthermore, note that the search guide chapter on conversions states that “we look at things like clicks, favourites and purchases” when calculating the listing quality score [emphasis added]. That means there are other factors they aren’t mentioning, possibly opening an item more than once, adding it to a list, or sharing it to social media. But they are careful to emphasize that views and sales are the two most important parts of this score, so that is where seller focus is best spent. I’ve long suspected that adding items to the cart was part of listing quality, but my testing has been inconclusive, probably because it is really not a large piece of the score. While it is interesting that Etsy revealed this, it’s not something I am concerned about. NOT ALL ATTRIBUTES & VARIATIONS ARE SEARCHABLE! : I’ve been telling you for over a year now that some attributes and variations are not searchable, meaning that if you search for your items using words that are only in certain attributes or variations, your item may not appear. In November, I expressed confusion about why some were used and some weren’t. Heck, I reported some missing ones as long ago as in June 2017, and never received any information or resolution from Etsy. At first, I assumed it was just a very slow roll out. Adding everything at once would have massively disrupted the search results, as that would involve (in some cases) more than doubling the words any given listing could be found under. However, it has been 18 months now, with little progress in the last year, so I have been wondering what was taking so long. It was only when a recent bug involving all categories and attributes drew forum attention that it became clear: it is mostly one word attributes and variations that are searchable right now; almost all attributes with more than one word or number are missing from search. E.g., the Recipient attributes “women” and “men” come up in search, but “unisex adults” does not. I’ve used the last option on many of my dinosaur fossil pendants, but as shown in the screenshot at the top of this post, I get no results when when searching “dinosaur pendant unisex” within Calgary . This ring can be found when searching for whole digit US ring sizes, but not half sizes, because Etsy hasn’t made the half-size variations searchable. This creates bizarre situations where sellers’ visibility can be limited. For example, if you search for a made-to-order ring, listings that use Etsy’s ring size variations will appear for specific whole sizes, but not for half sizes. The ring on the right (from MyWiredImagination, and used here with the owner’s permission) appears in the results if you search for a size 7, but not if you search for size 7 1/2, despite using the Etsy-provided variations for ring sizes. Now, as completely illogical as this is, it would not be a huge problem if Etsy was upfront about it, so shop owners would know to add “1/2” to their titles, or “unisex” to their tags. Sadly, repeatedly throughout this Guide, Etsy tells us that “[y]ou don’t need to add tags that are exact matches for attributes you’ve already added” and “your listing will appear in the results” if you use the buyer’s search terms in your titles, tags, categories, attributes and variations. Etsy staff are well aware that this is not true, from the numerous Bugs threads and questions to Support, but they released these statements anyway. So, why is Etsy misleading sellers about how to optimize their listings right now? We can only speculate, since they have not addressed this issue. Some other suggestions in the guide seem to be looking towards the future instead of accurately explaining the present, and that could be true here - they may still have plans to add these attributes to search, possibly even in the next few months. They are also likely using these unsearchable attributes in various experiments with the machine learning processes in search, and the more people add, the more Etsy can experiment. Of course, the problem is that people have already taken Etsy at its word on this topic, and some have removed words from tags because they falsely think they can be found under the attribute instead. Those sellers have harmed their shops by making their listings less visible, right before the busiest shopping season of the year, simply by believing Etsy was telling the truth. If that makes you angry, let Etsy know how you feel by contacting Support, or posting in the Bugs forum. Ask them why search isn’t working like their brand-new Guide says it does. ARE SHORTER TITLES PART OF THE ALGORITHM NOW? : When Etsy first introduced the relevancy search in 2011, shortening your title could usually help you rank better for the remaining phrases, but that diminished a lot in the last several years. Despite that, Etsy has recently been pushing for shorter and less-stuffed titles, and so have I, because they are recommended by Google, and they are easier for customers to read, which should lead to more clicks and sales. Nothing has changed. The Guide does not expressly state that shorter titles will help you rank higher, and I haven’t detected any recent changes here. This might change in the future, and this could be an instance of Etsy warning us ahead of time, but chopping your titles in half will not bump all of your listings further up the search rankings. I’m still recommending titles between 70-100 characters, but not because that is an algorithm factor. It simply makes sense for Google and the human eye. If shoppers make a mistake and type “neckalce” instead of “necklace”, Etsy does correct it, as shown above - but they don’t cover every possible typo just yet. This has always been true, but likely has more impact these days given the greater number of listings we are competing with. It’s also true if you deactivate listings, so don’t do that just to avoid losing ranking; vacation mode is better because your pages still appear when people click on favourites, Google links, blog links, etc. Not every shop will experience this effect, however. As I have stated many times, this depends on a lot of factors, some of which have nothing to do with search. The shops most likely to take a hit here are those that get daily sales from search, especially if those sales come from ranking in generic searches. (Let me remind you that those big searches are not guaranteed, and you should not rely on them for the bulk of your income.) If you drive most of your own traffic from outside of Etsy, have a large repeat buyer base, or sell small impulse items that don’t have much competition, you might not lose any traffic at all when you return. Most sellers who have had this happen find that their items will bounce back fairly quickly, and that listing new items and driving some of our own traffic came jumpstart your shop upon return. So don’t avoid vacation mode if you need to use it, but do be aware of the potential effects. YOU STILL NEED AN EXACT PHRASE MATCH IN COMPETITIVE SEARCHES: Chapter 1 was very clear on this point: “If those keywords are an exact match for the query, your listing may be ranked higher in results because it’s seen as more relevant to the search”, with “keywords” being “tags, titles, categories and attributes.” (They also repeat this point in the query matching video.) I’ve tested this again since the Guide came out, and it is still true for competitive searches, i.e, the ones where many people have the exact phrases in both titles and tags. For the past year or so, this has not been true in non-competitive searches, possibly due to the machine learning that is going on. Exact phrases in tags still matter as well, matching the title phrase, but have less strength on their own. Tags get less weight in general than they did 18 months ago, and this was most noticeable when I was testing title and tag matches in searches with Canada (where Canadian items will often be ranked higher in big searches due to regionalization). Removing an exact phrase match from the tags had little effect in a Canadian search, while it dropped listings quite a few pages in US searches. I respect your privacy. Your email address will only be used for this blog email list, and will not be shared with other parties. “Where a phrase is used in your title” - I first told you this was confirmed in June, but for some reason they still haven’t fixed the old Help files on this point. Remember, though, that shoppers can see very little of the title in the search results, and Google does give a bit of extra weight to the first part of the title, so I would suggest making sure it clearly describes your product, even though it is not an algorithm factor. description. “Etsy Search does not scan descriptions for search ranking purposes, but search engines like Google will sometimes look at them.” I’ve seen a few people insisting that Etsy now uses the description for ranking, but that simply isn’t true, and you can easily check it if you don’t trust me. I suspect that some people are getting confused by examples where the search word isn’t found in the titles or tags, but as I explained in previous blog posts, Etsy is currently using several AI techniques to test matching listings to phrases without all the words. In those examples, the searched terms/phrases are almost never in the description either; Etsy is making that association in other ways. WHAT DO I DO NEXT? HOW SHOULD I OPTIMIZE MY SHOP NOW? As I detailed above, not much has changed in Etsy search just yet. Most of this Guide just confirmed what we already knew, and the one new element (shipping charges) does not seem to have much weight today. So, if you have been following my advice up until now, you don’t necessarily need to change anything at this time. However, be aware that things such as high shipping costs and rambling titles have been proven to put off some consumers, so you shouldn’t automatically ignore Etsy’s suggestions, either. That said, Etsy is continuing to make changes to the appearance of the search pages (free shipping trucks, best seller badges etc. ), and is also slowly altering the weight of various elements of the algorithm, all of which can affect shops quite dramatically in some cases. If you are ranking well at the top of big popular searches right now, do not expect that to continue indefinitely. There could easily be some larger changes on the horizon, so keep diversifying your keywords to show up in many small searches as well as the bigger ones. If you want to be informed when Etsy does make those changes, sign up for my blog email list, or follow me on Twitter - I will always report on what is happening. Did I miss something in this blog post? Please leave a comment below, and I will answer your question, or email me using the link in the top right corner, or convo me in my SEO shop. comment on some of the current rumours. I will also include some tips for adapting to the new reality. You can get caught up with older changes due to the machine learning experiments in this post from November. Please remember that even though some of the new ways search is working have been around for several months, they may not be permanent. Etsy admin have hinted that some effects may change as the machine learning process continues and the new AI figures things out. Most often, they have said this about "clumping" (see below), but it could also apply to weirdness like the lack of title-tag phrase relevancy in small, non-competitive searches (discussed below as well). So, don't immediately assume that any new or different things you see in search are permanent shifts, or are the result of the AI, unless Etsy says so. And even then, be aware that they may change their minds. Previous Etsy search developments - What's Happening now? One of the basic rules of the Etsy relevancy search has always been that having the exact phrase searched in both title and tags will rank you higher than listings that simply have all the words somewhere. Since last fall, that hasn't been true in searches where few listings have both title and tags fully optimized, what I call "non-competitive searches". It still applies in large, generic searches where tons of listings have the search phrase the buyer used, however, so you should still continue to phrase matching as an SEO strategy right now. Example: the first several pages of the search "stone earrings" all have the exact phrase "stone earrings" in the title and the tags; out of just over a quarter million items in that search, over 45,000 listings have that exact phrase somewhere in the title or tags (you can check this by searching the term in quotes). You cannot rank for "stone earrings" sitewide without having it in both the title and tags. But when you narrow down that search to "stone earrings sterling silver" (a recommended phrase from the search bar), the vast majority of the top ranked items do not have the exact phrase in the title; many do not even have the phrase "stone earrings" in the title. Even though there are over 61,000 items in that search result, only 311 had that exact phrase "stone earrings sterling silver" at the time I did the search. So, there isn't much competition for the phrase, and phrase matching does not work for it right now. I expect this to continue for at least a while longer, and it is possible that Etsy will end up giving less weight to exact phrases as time goes on, including in larger searches. However, they could also eventually go back to exact phrase matching having more weight in smaller searches as well, even if they reduce it a bit in larger ones. This is not necessarily a permanent change. What can I do? - Nothing different at the moment, since it is very possible that this will not continue. Phrase matching still applies in competitive searches. If it is made permanent, it will mean no more worrying about matching tag phrases to the less-competitive title phrases you use, but you wouldn't want to make that transition now, just in case things switch back. I am not seeing divergent results like this set of screenshots from November based solely on the country settings at the moment, but it does appear that Etsy is using different ranking data for each country in at least some results. I wrote about rankings being based on the country settings (not the "ship to" filter settings, as they are with "localized" searches**) in November, using the examples "blue jays" and "football". Currently, I am not able to reproduce those results, although I am seeing some odd ranking situations when comparing results shipping to different countries. For example, my top-ranked item in a given search might change between several different countries. If I have three listings that appear for "big blue widget", the top ranked one in Canada may not be the same as in the UK or the US. Sometimes the differences are dramatic, with an item on page 1 in the US not appearing in the top 10 pages in Canada. (With Canadian localization, if all the other ranking factors were the same, my items should appear the same or higher here, for the same search.) I am seeing this for all countries, not just localized ones. So, it does appear that Etsy is recording the buyer behaviours that make up the listing quality score differently for each country now, and that listing rankings in various countries will slowly diverge if this continues. We don't know if this is a test or not, or a way of collecting data for the AI. I will let you know if it changes. What can I do? - Take my advice from November (that I've given for years, actually) to stop obsessing over ranking. While results aren't personalized to each buyer just yet, they will be varying more and more as time goes on; this is only one example of how search will transform over the next year or two. In my last update, I mentioned that Etsy had removed the diversity factor (which prevented a shop from having more than one item on the first page of a big search) from their list of search criteria, and staff confirmed that seeing multiples on a page was not a bug. See the screenshot at the top of this post for an example. At this time, "clumping" (as this phenomenon has been nicknamed) is continuing, but some sellers report that Etsy has told them it is not a permanent situation. It's been happening for nearly eight months now, so it obviously isn't hurting Etsy's income much - in fact, sales were up quite a bit during the fourth quarter. So, while many people feel that showing multiples is bad for buyers, apparently Etsy buyers are okay with it overall. What can I do? Again, there isn't much you can do other than the usual optimization tips I recommend, especially using lots of diverse keywords in your tags. Search rankings can shift overnight now, and will vary by time and place, so you can't expect to stay on page 1 even if clumping goes away again. In November, I mentioned that some but not all of the attributes have been added to search (meaning that you can find listings in search that only have the search term in the attributes). There hasn't been much progress here; in fact, some of the attributes are no longer searchable within your own shop, even though they do work within Etsy search results (for example, the jewellery recipients "men" and "women"). The now-standard explanation of how to use the Holiday attribute. Custom colours and custom variations are still not searchable, even though we were told back in November 2016 on the beta testing team that they would eventually be included. I've not seen any evidence of Etsy testing them, nor have I heard of staff stating that they were no longer considering this improvement. "...holiday attributes are not for when you'd gift someone an item, but rather where you'd wear or use the item." This is a fairly big change in directions. Previously, sellers had been told to use attributes wherever they applied, leading many shops to use major holidays on any items that could be given as gifts. The narrower usage makes sense, but since you can still add these days to your titles and tags, this isn't going to stop articles from showing up in every search related to a holiday. What Can I Do? - keep adding attributes where they apply, and start removing the Holiday ones you are now using incorrectly. I will be surprised if we don't see more attributes showing up as filters by October. I know I usually say to ignore most tests, but these ones all demonstrate how Etsy wants search to work in the future, so they are worth commenting on. It's possible we will never see anything like them again, but I sincerely doubt that. The image recognition test in February only added irrelevant items to the search results, as far as I could tell. What we’re testing: We’re testing image recognition technology to see how it might be used to improve search results on Etsy. This technology will look at your first listing photo and identify additional relevant search terms, helping to match your listing to more relevant searches. ... we’ll update you here on the results. I did not find a single example where this test worked, although I am sure there must have been a few. What I found, again and again, were completely irrelevant items being inserted into fairly basic searches, usually at the end. The above screenshot is an example; the software inserted cuff links and bracelets into a search for earrings, based on what the photo looked like. The cuff links do look a lot like the earrings sold by the same seller, but that doesn't make them earrings. If it worked even part of the time, though, this would be a great addition to search for newer sellers who don't yet know how to list. You know the listings I mean - the ones with something like "Rhapsody in Blue" for a title, no attributes, and only the Jewelry category as a tag. Etsy has stated that they want to make listing easier on sellers, without so much worrying about getting the exact correct title and tags (see here at around the 13:30 mark, for example), so I would expect this sort of development to be a high priority. All of the attributes you can apply to pendants and necklaces, used as search filters. I saw this March 14, 2018, but it hasn't popped up since. When Etsy introduced listing attributes to sellers in February 2017, we were told they would be used as search filters, as well as be searchable terms. With the exception of a few common attributes such as colour, and some housewares products such as rugs, this hasn't been happening yet. But on March 14, I caught all of the attributes for necklaces in use as filters. As you can see from the collage on the right, the list runs down half the page before you even expand any options. Was this a search test, or just a programming mistake? Hard to say, but it was gone fairly quickly, so maybe it was an engineering error - it certainly wouldn't be the first time code leaked out well before Etsy intended it to. So, we don't know if we are ever going to see a page like the one I am describing, and we don't know for sure that they are only going to use attributes to populate those filters. (In previous testing of search filtering, Etsy has looked at titles and tags as well, but not for every listing.) So, if you don't add attributes to your listings when they apply, you run the risk of not being found in a filtered search, should this ever go live. This is why I keep recommending everyone select appropriate attributes on every listing they work for. Another development I've been waiting over a year for is the automatic conversion between metric and imperial measurements, which we were promised all the way back on the attribute and variation prototype team in November 2016. How it would work: anyone listing something like a bracelet could list the length in metric (centimetres), and someone in the US would see the variation option in imperial (inches); it would also work the same way in reverse. This is a long-needed addition to regional customization on Etsy, and I am really looking forward to it. Well, I saw it in early December! Variations and attributes that show up on the top right of a listing page were converted, if the viewer used a different system than the shop's. Unfortunately, the conversion was to two decimal places, so you had weird values such as 53.34 cm (21 inches). Also, it showed up in listings but wasn't searchable, as variations & length attributes haven't yet been added to search yet. This would be a big help to sellers who don't already do conversions for their customers, but possibly a corresponding disadvantage to those of us who do list in both systems, since Etsy will be taking away our competitive edge. It's impossible to say how much impact it will have until this feature is in use for quite a while. There's been no word on when we can expect this to appear again, or if they still intend for it to be permanent some day. We see many rumours, and even flat-out incorrect statements, about Etsy search, probably more so than usual in the past year. I thought this would be a good place to deal with some of the recent ones. Does a listing's category matter to its search ranking? Several sellers have reported that having items in a different category than the majority of similar items on Etsy can mean your item will rank poorly, compared to those in the "correct" category or subcategory. I had observed some search pages earlier this year which seemed follow this rule. But is it true? Short answer: I am still not certain if it is a direct factor, but it certainly is an indirect factor, since customers can click on a category or subcategory on the left after doing a search, eliminating listings in other categories. Long answer: After quite a bit of testing and discussing this with other sellers, I am leaning towards saying that a listing's category doesn't usually have a direct impact on its ranking in search, but there may be exceptions, and this could change in the future. If a pair of earrings is not in the Earrings category, it can't be found in a search for 'earrings' once a customer clicks on the subcategories in the sidebar. Getting fewer clicks from search can hurt its rankings. To test this, I took several different types of items out of their normal categories, and placed them in less-accurate ones. The search ranking did not change immediately, nor were there definitive changes in ranking when I left listings in the wrong categories for several weeks - some went up and some went down, which is normal behaviour right now for most listings. In some cases, a listing could legitimately belong in two subcategories (e.g., crystal pendant necklaces could fall under "Pendant" or under "Crystal Necklace"), so I tested items like this as well. I am still following one listing of mine which appeared to drop substantially about one week after the edits, and moving it back to its original subcategory seems to have moved it up again somewhat, but that could be a coincidence. I witnessed more ranking changes than usual around this time, across the site, and some of the items from other sellers that were in incorrect categories and had low rankings have now moved up as well. So, my testing is inconclusive so far. I think, with some possible exceptions, that most of what we are seeing is the buyer behaviour element interacting with the algorithm, due to being found in the category filters on the left. Clicks, favourites and sales from search are still included in the algorithm, so showing up in fewer filtered searches could reduce a listing's quality score. Is Etsy Adding Words to Listings? Note: this is a different situation from Etsy adding attributes and sub-categories to people's listings, which has been happening for a while now. In this section, I am talking about adding words to the title or to tags. This possibility first arose in this thread mid-February in the Etsy forum, with a few sellers complaining that Etsy had added gift terms to their titles or tags. Some posters claimed they knew others this had happened to as well, all on pet items. 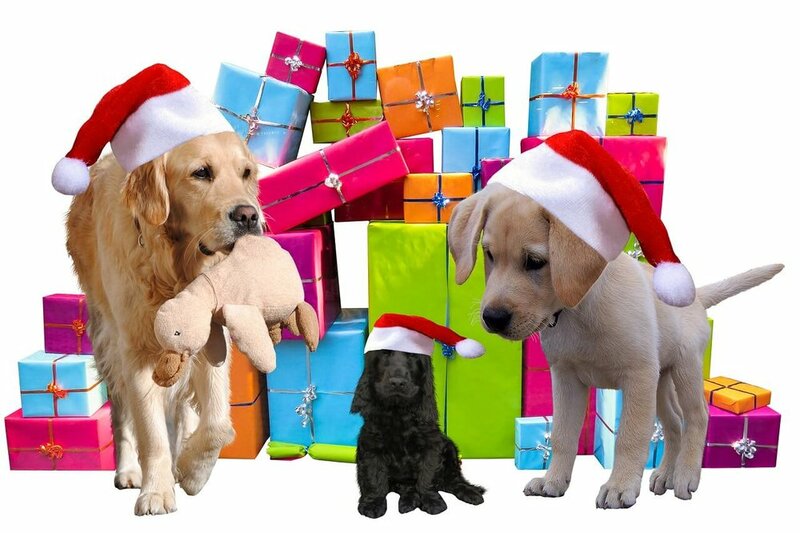 I believe the shop owner who started that thread when she says she did not add gift phrases to her shop, since the goods are made to fit each dog, and therefore require exact measurements. Although I asked around, I only found one other case, and it was not for pet items, nor did it involve gift phrases. Angie from ThrowItForward contacted me with examples from her shop's tags, which she says she did not add herself. I found cached versions of some listings from December 2017 with the added tags, so they had remained this way for at least two and a half months. All of the added tags were not capitalized in her usual style, and were not the type she generally uses, but all of them made sense for the listings. While some could have been taken from the attributes or even the description, one in particular really stood out: the tag "blond boy photo" on a vintage sepia photograph. The word "blond" is not mentioned anywhere else in the listing, not even in the description, but the photo is of a toddler with very fair hair. Someone at Etsy apparently thinks dogs need more gifts. Check the staff list for any canine hires! some were added as part of image recognition testing, using phrases from similar listings. I think option number 2 is mostly likely, although image recognition could easily be involved in the blond boy example. It's possible that all three options have happened. More importantly, why was this done, and will it happen again? Etsy would want to do this for the same reason they did the image recognition test discussed earlier: to add terms that are missing from products, to make them more searchable, Done properly, it is obviously something that could help some sellers, but done poorly, it could add irrelevant items to search, or even create angry customers who were expecting a different item in the mail. Despite the risks, it is going to happen again, although perhaps in a different form. (What may change is seeing the search terms on the listing page; they could instead do what they did with the image recognition test and make the added terms searchable but invisible to everyone.) Etsy is really concerned with improving the searchability of shop owners who do a worse-than-average job of adding various keywords to their products, and with making sure that buyers can always find the best product for them. Etsy is going to find a way to do this, so it is up to us to watch to see if it hurts or helps. Do you have any further examples of this behaviour? Please post them in the comments section on this blog, or shoot me an email. You can test this - search for a word that is only in a description. You can't find it in Etsy search, right? So, the description isn't searchable. Now, I am not saying that Etsy has never tested this (so you may have seen it in the past several months), and they may decide to make descriptions searchable again in the future, but right now, do not assume that words in your description will help you be found on Etsy, because they won't. I think this rumour has mostly arisen because people do not realize that some of the hidden attributes are searchable; that accounts for almost all specific examples I have seen people claim. Other examples might have come from the image recognition testing mentioned above, or similar tests. But please understand, Etsy has not said anything about the description being searchable, and in fact admin told the attendees at the recent Etsy Canada meetings that descriptions are not used in Etsy search. What's Up Next for Etsy search? I will continue to update developments here on my blog, but you can also follow me on Twitter, or on Google+, for major changes and breaking Etsy news. Have any questions, or any observations you want to share? Please make a comment below, send me an email (click the envelope on the top right of the page), or send me an Etsy conversation. I will update this blog post as situations develop.